Kids and Teens Can Soar Like a Superhero at iFLY’s Flight School! So, you want to skydive but the thought of jumping out of a plane scares you? Trust us, the dynamos at Fort Lauderdale PR firm Durée & Company get it. Luckily at iFLY, there is no jumping out of plane! It’s just you lying on a cushion of air learning how to manipulate your body to fly. It’s an incredible adrenaline rush. The best part about iFLY? Almost anyone can fly! Whether you’re 3 or 103, you can experience the feeling of free fall without the worries that come along with actual skydiving. For children and teens interested in the sport (yes, it is a sport! 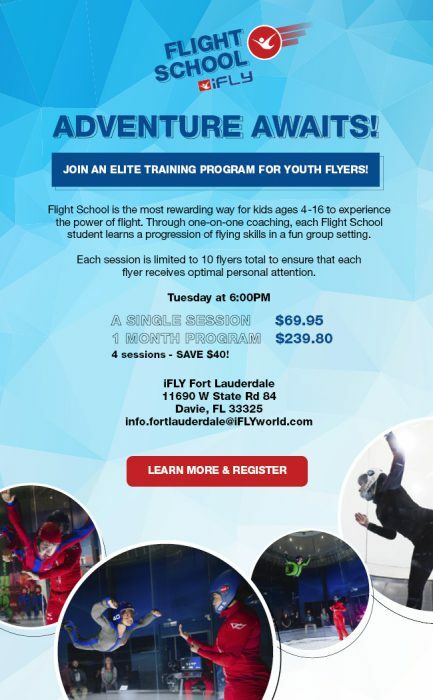 ), iFLY offers its Flight School program, weekly one-on-one, indoor skydiving coaching sessions that takes place at both their Fort Lauderdale and Orlando locations. Students learn a progression of flying skills in a fun group setting led by a flight instructor who is highly trained in safety standards and certified by the International Bodyflight Association (IBA). Each session is two hours long and includes a team briefing, warm-up with stretching, and five minutes of flight time. Instead of a parachute, there is a large glass tunnel with a massive wind generator that allows you to fly. It takes the element of fear away, while still giving you an adventurous and exhilarating experience. Plus, each student receives exclusive Flight School member discounts on personal flight gear. Flight School students can showcase their skills at the Quarterly Flight School Competition – an event that takes place four times a year. Winners from each location advance to iFLY’s Annual Flight School Regional Competition! Indoor Skydiving is an addictive sport and can easily become every kid and teens’ newest obsession. If you’ve ever seen the instructors do flips and tricks in the tunnel, you know what we mean. There’s nothing like the thrill of indoor skydiving, it will lift you off your feet…literally!